This page introduces you to gold plating, stripping chrome plate and using our ActiClean to activate and clean the surface of your work to make it ready for plating. For the purposes of the demonstration, we'll be using a short length of copper tubing that has been previously nickel and then chrome plated. Learning how to chrome strip can go hand in hand with learning how to gold plate as it’s almost impossible to plate onto chrome. So, If you want to gold plate something that has already been chrome plated e.g. a bathroom tap, you’ll have to strip off the chrome first. There is one advantage, however to this process; chrome plating almost always needs to be plated on to a thick layer of nickel, so you can guarantee that whenever you have to strip chrome, you'll be stripping back to a layer of nickel. This nickel layer can then be used as a handy pre-plated barrier layer for your layer of gold, as gold can't be plated straight on to copper or copper containing alloys such as brass or bronze as the gold, over time, will diffuse back into the copper. Thanks to our extensive research into chrome stripping, we’ve developed a safer and greener chrome stripping solution called Safe-T-Strip. Not only is it much less hazardous and odour free compared to other stripping solutions on the market, you don’t need to electro-activate after chrome stripping. 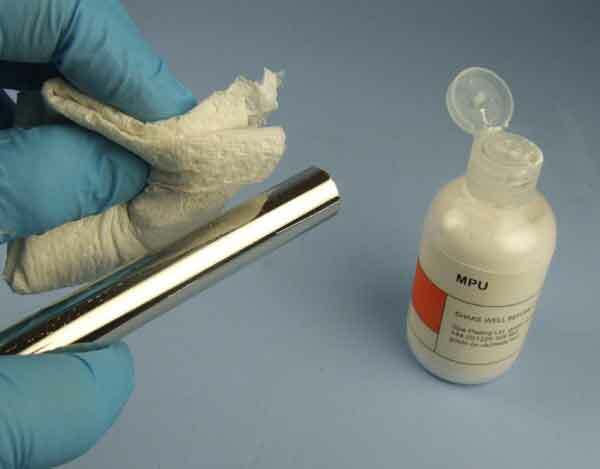 All you need to do is rub with MPU to activate the nickel layer and get straight on with plating. Finishing; MetaSeal. Equipment; two beakers, Power Plating Rectifier, two Drip Trays. Electrodes; one stainless steel and one platinum with the corresponding number of electrode handles, two swabs, two red leads and one black lead with a crocodile clip fitted. Arrange your work area as shown in the picture. Take two beakers and pour out approximately 10ml of Safe-T-Strip and 10ml of gold solution. Place these beakers in this order next to the two trays. Plug the red leads into each other to form a stack (this can be seen in detail in the next picture). Then plug the other ends of the leads into the sockets in the electrode handles. Mount the stainless steel electrode in the first handle and the platinum in the second using the allen key. 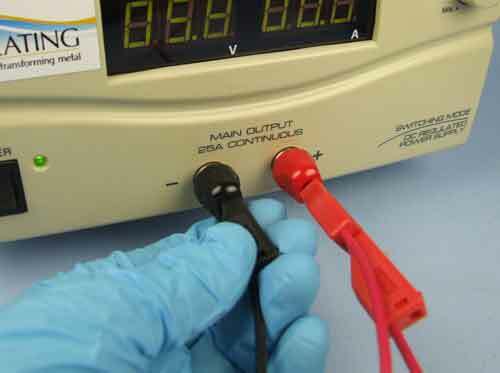 Place a swab on each electrode as shown in the picture. In order to strip the chrome, you need to reverse the normal current so, as in the picture, plug the black lead into the red socket on your rectifier and plug the two red leads into black socket. Grip your chrome plated item with the crocodile clip, which is at the other end of the black lead. The other ends of the two red leads should already be plugged into the ends of the two electrode handles. 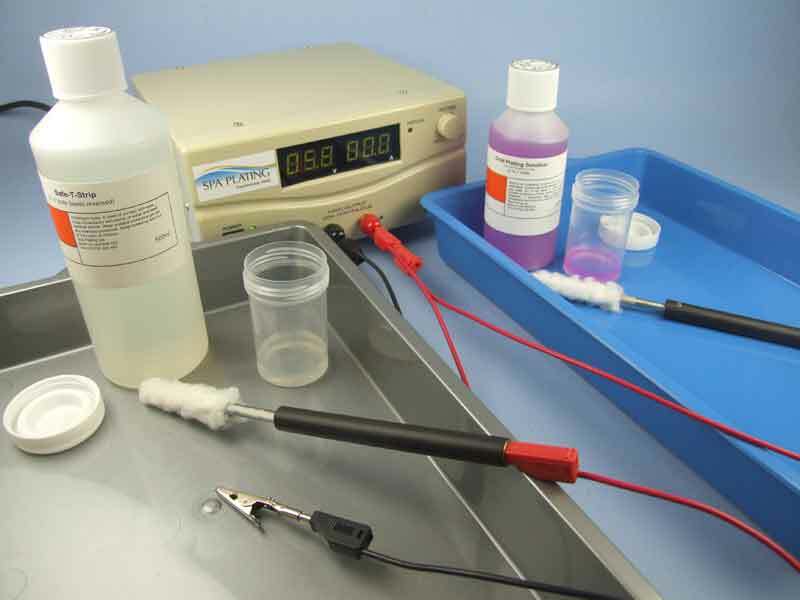 To ensure your electrode is completely conductive and your plating solutions perform at maximum capacity, wet your swab thoroughly before you start brush plating. You can use tap water or deionised water if you live in a very hard water area. Before you start chrome stripping, please be aware that chrome is almost always plated on to bright nickel, so you’ll know when you’ve successfully stripped the chrome because you’ll see the straw coloured layer of bright nickel underneath. 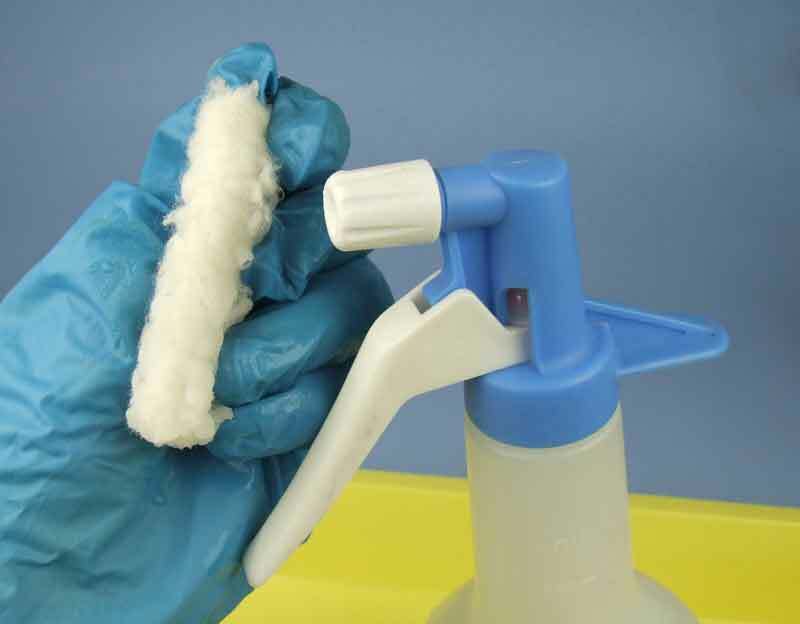 Dip the swab into the Safe-T-Strip and brush the surface of your work with the carbon electrode using small circular movements. Do this until all you can see is the straw-coloured layer of nickel underneath. The chrome layer should come off very quickly. Rinse your work with water. NB – If you are using only one electrode to chrome strip and gold plate, make sure you rinse this and the swab thoroughly between stages. Activate the surface of your work in preparation for gold plating by simply rubbing with MPU with a clean piece of tissue. In order to gold plate, you must restore the normal direction of current, so plug the two red leads into the red socket and the black lead into the black socket. 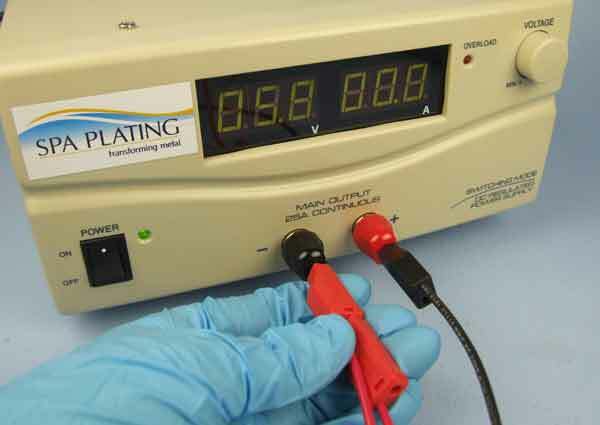 Take up the platinum electrode, dip it into the gold solution and start plating with the same circular movement, working gradually all over the surface of your work. You will need to keep dipping the platinum electrode in the solution to replenish the gold. If your work has sharp corners, reduce the voltage while you plate theses areas, otherwise it will burn and result in a soft plate that will easily wear off. 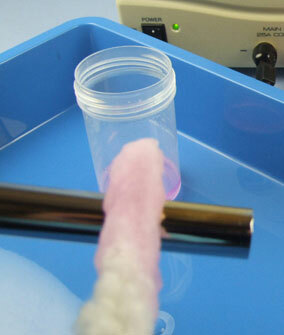 Try to keep as much contact between the swab and the work as possible, to get maximum plating results. With the swab in maximum contact with the work surface, 0.5 amps are flowing and the plating rate is at its maximum efficiency. 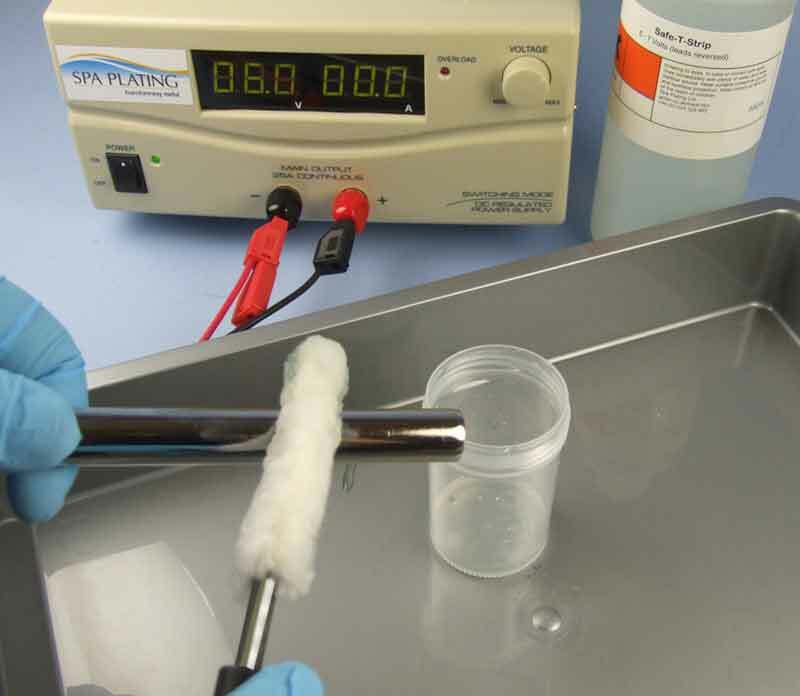 If the swab was only in contact with the work on a limited part of its surface the amps would drop to 0.2 or lower, which would mean the plating rate had dropped and less gold was being deposited on the surface of the work. 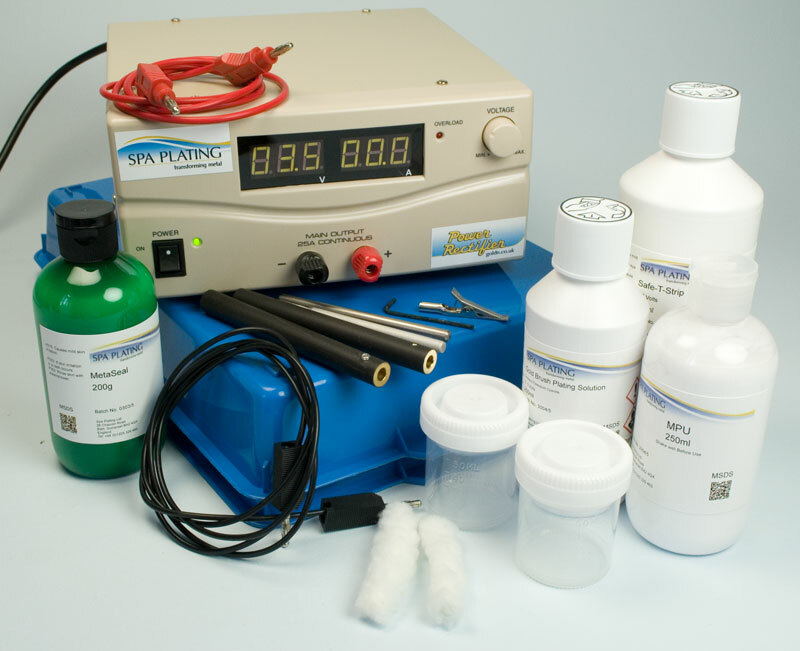 To calculate exactly how much solution you’ll need and how long the plating will take, take a look at our online Plating Calculator to the right of the tabbed panel on the Gold Brush Plating Solution product page. Keep plating for at least five minutes to build up a good layer of gold. Rinse. To bring out the final lustre of your work, polish with MetaSeal.